In case you missed it here are some of the happenings in the world of defense technology that we didn't write about last week. 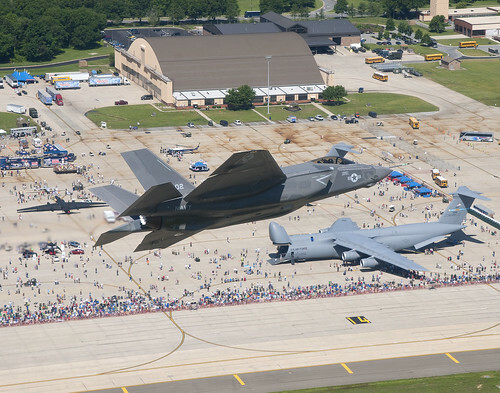 First off, the F-35 Joint Strike Fighter made its first ever air show appearance yesterday at Joint Base Andrews' open house, with an F-35C carrier variant performing a quick flyby followed by an F/A-18 chase plane. the JSF program is comning under increased scrutiny from Congress and auditors despite the fact that program officials insists it's sailing through its flight test schedule. The biggest complaints are about projections of continued cost spikes in the coming years. Remember, it breached the Nunn-McCurdy statute capping cost growth just last year. Speaking of fighters, China is accelerating the delivery of 50 JF-17 Thunder fighters to Pakistan's beleagured military; a move the Wall Street Journal describes almost as a hedge against the threat of America withdrawing military aid in the wake of the bin Laden scandal. This latest batch of JF-17s will compliment the 50 already being assembled inside Pakistan. Meanwhile, check out this tiny killer drone equipped with an even tinier missile.